Yesterday, life in Toronto changed. This was clear as the snow fell, caressing the warm pavement before melting flake by flake into oblivion. The beautiful bluster signalled the opening movement of yet another seasonal adagio, one which we know and which epitomizes the passing of yet another year. This year, though the accompanying dance is the same, the stage is different. Subtle cues are a constant reminder - the leaves still grasp tenaciously at their branches and the constant thrum of the city, its sirens and horns are the undercurrent to a life which though sounding wild is now distinctly urban. As I walk through my new-old apartment I am struck by my sense of familiarity with this place. The rusty nail head which projects from the wooden floor of the dining room, seems to exist for the sole purpose of plucking at my sock. This is now a common occurrence in a life displaced. As I ruminate on this and look out on the spectacle distanced from me by a single pane of dirty glass my mind gently slides towards old habits. My mind has lingered on chutney for the last week or so. The fruit has sat patiently in the fridge, waiting for a moment which could not have been more appropriate. While outside a fine layer of powder fought a downhill battle, I unpacked jar upon jar, enjoying as I always do the quaint designs which ornament them. These pastoral cornucopia evoke as ever a rustic flair, one burdened with the reality that each of these jars, although hinting at an artisanal past, are yet another testament to seamless and perfect mass production revealing neither chip nor fragile bubble in their empty walls. This juxtaposition between the past and present is made more evident when these jars are filled, allowing us a glimpse at imperfect chunks of fruit suspended and viewed through a lens of forced perfection. There is something tantalizing here, in this jar of chutney, which goes beyond a simple blend of complimentary flavours. Physically, it is as stated, contradictory. Emotionally it seems a perfect agent for signifying transition, from space to space and time to time. From the standpoint of memory, while this batch of chutney is fresh, the recipe itself is old, speaking volumes beyond what can be contained in an otherwise unremarkable jar. On a personal level, this is the recipe of Shannon’s grandmother Eugénie, extracted from a forgotten newspaper thirty of forty years ago and existing within a family far beyond its flash of municipal fame. How many people have squirreled this yellowing strip of paper away, taking it from a publication which is by nature implicitly ephemeral? How many people have squirreled this yellowing strip of paper away, taking it from a publication which is by nature implicitly ephemeral? How many traditions is it at the root of? To whom are Christmas tables incomplete without this ruby-red jar acting as a prism for a dinner’s celebratory delight? In this way, this chutney is special; it has taken places in memory both collective and personal, existing for individuals and families. How many, upon seeing this recipe in print, in one fleeting moment re-appropriated it for themselves? Making changes, altering it, fabricating a food which was squarely theirs, one which is unique in its own time and space, cementing individually the identity of a food which emerged from a collective. Beyond this, where does this chutney’s story extend to? Canadian apples and pears are enmeshed with cayenne and ginger. The name, the sweet and sour which grace your palate. These tie themselves together, pulling at their imperial roots. These roots are as ever, intertwined with colonialism, juggling subjugation with cultural inquiry in the greater framework of culinary exchange. This jar of chutney is complex, in flavour and in history. It is a step in an evolving process, a story that remains to an extent inaccessible, locked in the privacy of the families which have made it their own and in the multiple permutations which it stems from. The contradictions that this chutney embodies, between its ingredients, sweet and sour, between the roughly cut fruit and the smooth walls that contain it, each extend to this food’s identity, made unique by its private life but which would have remained obscure if not for a fleeting moment in the public eye. Nothing better reflects the dichotomy between cold snow and warm pavement than this otherwise humble chutney. Winter’s beautiful first failure to take the lead in a dance which it will inevitably dominate, before itself fading from center-stage. This food, this space, this season, surfaced to me as the channel through which to re-define home away from home. 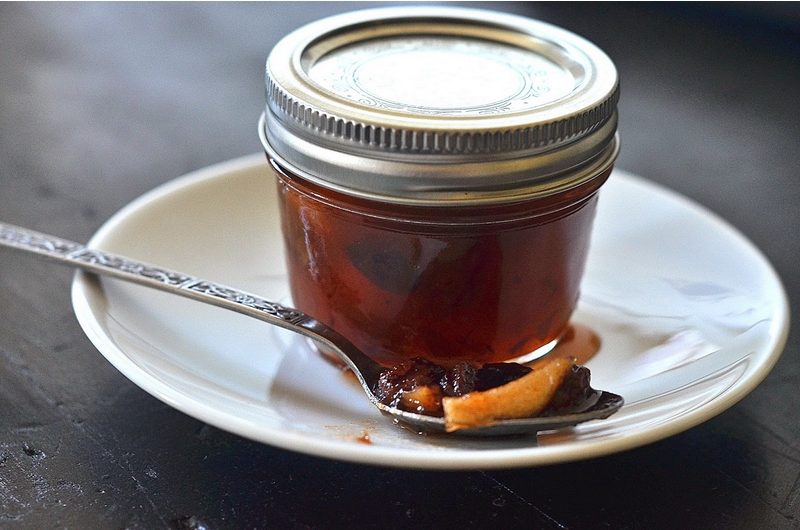 Regardless of what meaning this chutney does or does not have to you, here is the recipe. Perhaps you too will find your own meaning for this not so humble preserve! While it is a general rule not to tinker with preserve recipes, I was short a few hundred grams of pears and apples, I replaced these with cranberries. Also, fair warning, the fruit must optimally sit in the vinegar for three hours before being cooked, this is the kind of recipe which requires a whole afternoon! This one is sadly late to the races when it comes to seasonal foods, but I guess I just had too many summery recipes for too short a summer. No worries folks, though summery it may be, nothing should stop you from making this tasty falafel. Not only are these little balls of happiness tasty and fresh but they’re surprisingly healthy to boot! They fulfill a wide variety of health niches too being vegan, gluten-free and everything in between. Due to a baking method I use, they’re also low on fat and as I've replaced the traditional breadcrumbs and chickpeas with lentils and green peas so for all you fit people out there, it’s low-carb/high in protein as well! This recipe attempts to bring the rich floral notes of herbs to the forefront of this traditionally earthy and spicy favorite. I've found that these flavours are best highlighted by a light relish of onions and peppers cooked in the juice and zest of an orange. Topped with a vegan coconut curry sauce or some garlic mayo and wrapped in a pita or mixed into a salad and you have one tasty and fulfilling meal! Feel free to play with spices, here I added saffron, a tiny bit of star anise and kaffir lime leaves! For the falafel it's simple enough. First up, grind the lentils to a coarse flour, a coffee grinder should do the trick! Some days are tough days, others are swell, finish with liquor and evenings end well... to a certain extent anyway! We’ve all had some evenings that may not have ended so well after a few drinks but really, for those of us who might hit the bottle every now and then, what’s not to like about finishing off a day with a good old fashioned libation? After a long day spent buzzing around in an effort to submit some federal grant proposals of epic proportion I decided to reward myself with a touch of something potent and in this case something potent was none other than an elderflower bourbon sour. As of yet, considering that I once trained as a bartender, I’m actually quite surprised that I have abstained from posting one of my cocktail recipes to this site for so long. Thankfully though, there is a first for everything! This cocktail celebrates our lovely post-prohibition era by adding new elements to an old favorite. The smooth base of elderflower with the tang of fresh lemon and the woody char of bourbon, served up chilled or on the rocks with a brown sugar rim move this sour beyond the traditional G&T/rum & coke spectrum of cocktails. This drink makes a swell apéritif, or is good sipped for a cinq à sept alongside a variety of salty morsels. My shaking glass was out of commission at the time so I grabbed this one. In a pinch? feel free to use a mason jar! And remember folks, to quote American poet Ogden Nash (or Willy Wonka if you prefer) "Candy is dandy, but liquor is quicker!" Tis’ that time of year again! It’s fall, season of hot beverages on instagram, facebook posts about pumpkin spice lattes permeated with yuppie zealousness and ultimately, time to cozy on up. Fall is traditionally the time to bring in the harvest. Here above the 49th parallel we joyously stuff our mouths with all things pumpkin, apple, plum and cranberry celebrating the beauty of our changing daily landscape all the while muttering ominously that “winter is coming”. Flannel shirts and wool socks aside, this is the time where we can most feasibly excuse any decadent eating (aside from you know, CHRISTMAS. It’s coming too!) under the great overarching banner that with cold on the way we need our reserves. Fall is a time of great beauty where sweaters, glorious large sweaters and tuques, simultaneously hide any new curves as well as mussed up hair under a thin veneer of seasonal fashion leaving us to enjoy the season to its fullest. So with the excuses established and the stereotypes set, it’s time to hit the kitchen and make some nice, rich, and even nearly-kind-of-healthy pumpkin spice loaf! Pour into your loaf pan and bake for 40 minutes or so, until browned and a toothpick inserted into the center comes out clean. Let cool and enjoy, preferably with hot tea! While sweltering heat might no longer be so common at this point in the season, mornings are still hot enough to merit a good cold beverage. In our land of lengthy winters where hot beverages are the norm, and where autumn leaves will soon find us collectively guzzling cappuccinos, we have to prize these moments of summer bliss where we can sit out back and break our fast on a perfectly chilled iced coffee and a bowl of fresh berries... or on a less healthy note, a fresh pain au chocolat! The latter became a bit of a ritual this summer for my dear flatmate Tyson and I (and our many fantastic house guests) as we’d pack up our coffees, teas and ice and walk to Montreal’s Lachine canal where we would pick up fresh pain au chocolat before enjoying a lovely breakfast in good company while soaking up the sun on one of Montreal’s finest vistas. A summer of experimentation with iced coffee has provided me with a certain amount of experience when it comes to making it. And subsequent thought on the matter, and people’s pleasant surprise when trying our iced coffee has made me realize something: many a person has no idea how to make a good iced coffee! This might sound odd to some, I mean technically it's just ice...and coffee...right? Wrong. Well, I mean, mostly wrong. Sure you can take some good old filter coffee (ick) and mix it with ice and what not but I’ll guarantee you that in most cases it’ll just end up tasting like watery sock juice. So how do we solve this quandary? By tackling each attribute of a good iced coffee one by one. For our first issue, we have to tackle the fact that much iced coffee is made with bad coffee and might taste like charcoal, or like the aforementioned sock juice. While not the coffee connoisseur that some of my friends are, I do know enough about it to state I like lightly roasted coffee and prefer an espresso or French press to the filtered stuff. So tip number one, use good coffee and a good method of extraction. From here we move on to issue number two: temperature. Here we can do one of two things, either chill coffee, or use a cold extraction process. As someone who likes my little stovetop coffee maker, I tend to stick to espresso which I chill the night before* or if I am with someone who has access to a fancy machine, we draw some shots and pass them through ice. Now we’re faced with another issue, we can either cool coffee overnight whereupon it oxidizes or cool it in ice, whereupon it gets watered down. Alternatively, you can whisk it in a cold water bath whereupon it chills without being diluted. While this option might seem like a perfect solution, at 7am in the morning a cold water bath and whisking treatment for my coffee is hardly an exciting prospect (nor are all the dishes it creates). Another solution is to make a “cold-extract” coffee, which entertainingly enough I’ve seen marketed as some kind of fancy shmancy new invention that is terribly difficult to make. Well Montreal food trucks and hipster cafes move aside! Cold extraction coffee is one of the easiest things you can make, no specialty tools or expensive machines required! Simply mix water and coffee directly in a container and let sit overnight in the fridge. As the water is cold, it’s more difficult for the coffee to infuse so you’ll probably want something like a 1:2 ratio of coarsely ground coffee to water. Combine it in an airtight container, leave the mix in the fridge overnight and strain the next morning! Cold-extract coffee is generally less acidic and has a strong concentrated almost espresso-ish taste (in my opinion anyway, but hey I’m no barista.) Cold extract coffee, certainly with coffee ice cubes thus solves all three of our coffee quandaries providing a good tasting, cold coffee that is not watery! Though of course...this also requires forethought, but cold-extract coffee is a great solution for a Sunday brunch, certainly if like me you tend to spend your time chained to the stove, coaxing coffees out of a stovetop espresso machine. Anyway: in theory you have now made your cold-extract coffee, or have chilled some nice espresso or what not, should you have gone the coffee ice cube route you can now combine them all together for a proper punch of rich, chilled caffeine to greet any morning stupor. If you’re into the black coffee thing, you’re good and ready to go, however, if like me you prefer your coffee sinfully adulterated feel free to play with it at this point. My morning usual is normally one of the aforementioned coffee bases mixed with cane sugar, a bit of skimmed milk and some soy milk for added thickness. I also tend to add a touch of vanilla either in the form of extract or infused into the aforementioned cane sugar. While cream would otherwise be a favorite option, neither my lactose-intolerance nor my waistline would be terribly grateful to me for its daily addition to my summer diet. Other fun additives can include hazelnut extract, vanilla syrup, melted dark chocolate (I’ve also heard of people melting nutella into their coffee) or if you’re really sinful, Irish cream, Grand Marnier of Frangelico. On a final note, I feel obliged to mention that should you take the coffee to go and decide on not adding coffee ice cubes, I’d recommend transporting the ice in a separate container and draining the melted water off before adding the ice to your coffee. This prevents the water from melting into your coffee and makes for a better drink when you arrive at your destination. Here’s hoping that these few tips (which seem to have become a veritable wall of text) can help contribute to providing you with a morning free of insipid iced coffee! *However many claim that as it ages overnight the coffee oxidizes and tastes icky, I tend to vacuum pack mine by putting it in a mason jar piping hot and capping it so it seals...I like to think it helps.